Mom, come on dont post that!! 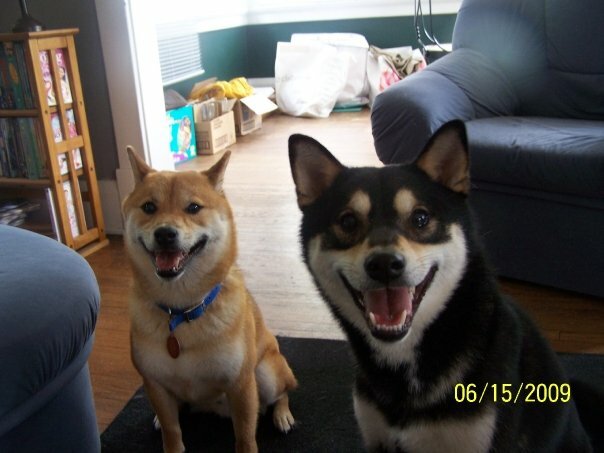 Don't you just miss having that little shiba puppy in your life? I know I do!! P.S. Mikey was adorable as well, no sweater though, I learned my lesson with Sully that the Shiba will NOT wear that horrid thing, they are much to sophisticated for such nonesense. LOL. So, Mom and Dad are offically married. They had a great time on their honeymoon or so they told me, I didnt get to go and it was sad. I was at grandma and grandpa's for the week but they keep us in a really big kennel most of the time so it was kinda boring, but none the less cool to be outside bathing in the sun so much :) I missed Mom and Dad though ALOT! Here are some pics from their wedding, which I didnt get to go to either. Oh well though I got pampered at the doggy salon when they got home though :) I LOVE going to the doggy salon, but Mikey hates it. 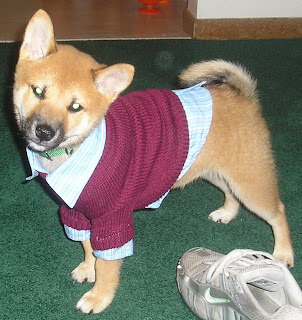 He hates it so much that he "shiba screams" the entire time and messes with my flirting with the stylists. He is so immature. Oh well. Im so happy for mom and dad and glad that we are all one big happy family now!! So... Mom and Dad have been soo busy preparing for the wedding that is finally after one year of planning HERE!! They are so excited and Mom said she has an important job interview on Wed with the only company in Toledo that is doing well right now! So we need to wish her luck!! Good luck Mommy!! But I cant wait for Mom and Dad to be married they seem to be soo happy about it. "Mikey you are hogging my man-chair! Ugh. You're so weird." Well Kitty is still annoying and Mikey is still weird! He's not as sophisticated as I am! But Mom says he is fine just the way he is, I dont know about all that. Anyways here are some more pics Mom took of us during nap time.